Help the songbird colony in your yard grow by offering them shelter in this Plantation Bird House and Decorative Mounting Post kit. This dramatic and beautiful package provides a significant bird house, along with a sturdy post for displaying it. Eight separate apartments throughout the dual levels of the Wing and A Prayer Plantation Bird House provide ample roosting spots, while bringing height and drama to your bird garden. The copper colored, metal roof and predator guards around each 1.5" diameter entry hole offer an elegant hint, perfectly contrasting the white body. Crafted from PVC lumber, this shelter will remain durable and beautiful for many seasons. Place the home on the included New England Decorative Mounting Post, creating a garden focal point in moments. The 60" height of the post situates this home at a fantastic display spot, and its white, vinyl construction meshes with the white hue of the abode. An included, galvanized steel anchor ensures the post remains stable in your garden, while trim on it matches the dual ledges of the shelter. The copper hue of the metal roof brings a timeless, elegant hint to the package, while the PVC and vinyl construction lasts for many seasons. 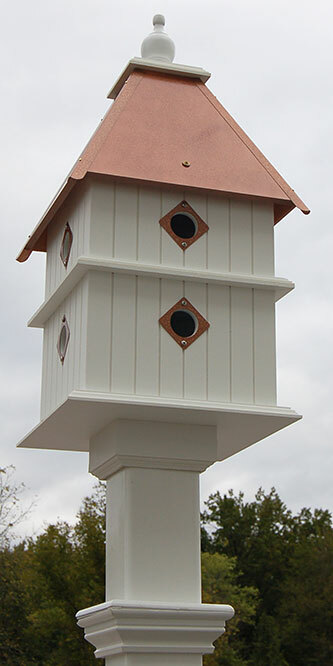 Invite many birds to roost in your yard by adding this Plantation Bird House and Decorative Mounting Post kit to it. Bird house made in the USA.